This is designed to reduce the most frequent causes of heavy fire losses due to drafts. Introduced by unprotected doorways, corridors and passageways which may channel flames from one part of a building to another and cause the fire to spread quickly out of control. It is commonly used for shopping mall fire curtain dividers, supermarket entries to mall, dividing wall between factories, offices and building and flammable storage buildings. The fire resistant roller shutter will be manufactured by 3rd Generation Doors. The curtain will be manufactured to form a two hour rated fire resistant curtain. The curtain will be constructed using roll formed galvanised interlocking steel slats fitted with steel end clips. The shutter will be fitted with an automatic closing device and controlling governor and to comply with the relevant standard and/or specifications tested on completion and supplied with a certificate of compliance. To be submitted for approval in each application to the local authorities for acceptance. These doors are manufactured up to 4300mm in height and 7500mm in width but not exceeding 25 sq. meters. The curtain will be manufactured using 75mm by 1.0mm thick roll formed galvanised interlocking steel slats. Each alternative slat will be fitted with steel end clips to form a two-hour rating curtain. The bottom rail will be manufactured using to steel mild steel angles of not less than 50mm by 50mm bolted to back with the last slat sandwiched between the angles. The bolts will not be less than 8mm diameter and fixed at not less than 300mm centres. Size will not exceed 4300mm in height and 7500mm in width and not to exceed 25 sq. meters to 3rd Generation Doors standard design and to be submitted for approval in each application to the local authorities. Chain operation is up to a maximum of 16 sq. meters. Electrically motorised is suitable for all doors and will consist of a 3 phase motor coupled to a reduction gear box incorporating upper and lower limit switches with provision for emergency chain operation in case of power failure. The roller drum will consist of a seamless cylindrical tube of not less than 165mm O/D to a maximum of 218mm O/D and no less than 4.5mm or 6.5 thick encasing helical torsion springs matched to suit the door size and weight and manufactured from a super grade wire revolving around a steel axle. The springs will have provision for automatic release/push down with a split axle mechanism to allow door to automatically close and to provide easy adjustment of springs. The roller drum will be designed to give minimum deflection over the door span. The roller shutter drum wall support brackets will be manufactured from mild steel plate having a minimum thickness of 8mm to 12mm depending on door size and weight. The brackets will be fitted with flange type ball bearings to match the shaft diameter and door weight. The brackets will have provision for fixing of masonry anchors to fire walls or directly to steel work (encased). The guide channels will be manufactured from cold roll formed galvanised steel channel being not less than 3mm thick and with a minimum depth of 55mm to 65mm and 75mm designed to match the door width. The guides will be fixed to the walls using specially designed fixing lugs. The fixing lugs will be manufactured from not less than 50mm by 6mm thick mild steel plate with provision for mounting bolts of not less than 10mm in diameter. The fixing lugs will be fixed to the guides and walls at not more than 700mm centres. 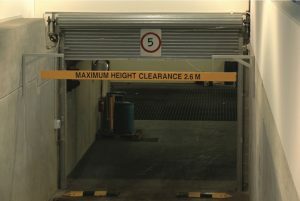 The fire resistant roller shutter will be fitted with a fusible link below the roller drum at one end and connected to a spring loaded automatic release arm. The release arm will then activate the automatic release/push down spring allowing the door to automatically close. The roller drum automatic release will be fitted with a specially designed automatic controlled descent governor to match the door size and weight. The governor will be designed to provide an average speed of between .025 mls and .03 mls. 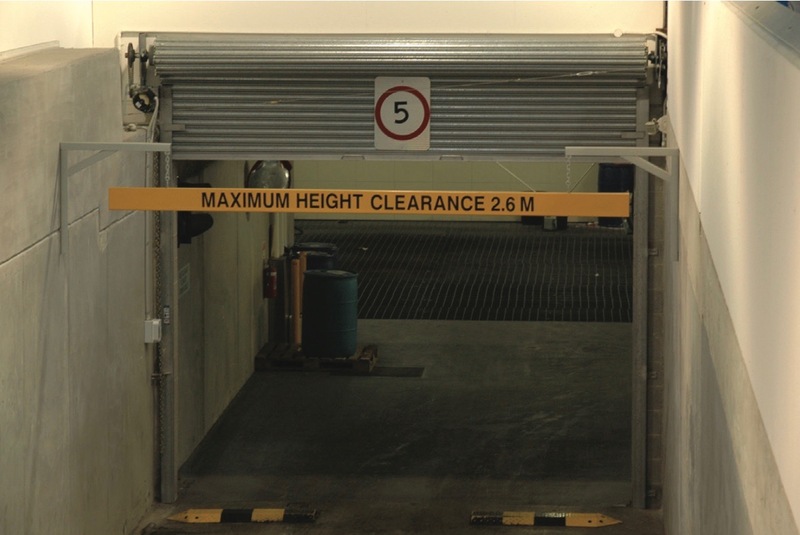 The fire resistant roller shutter will be labeled by using a metal steel tag being 50mm by 25mm. The tag will be stamped with the manufacturers name, fire resistant rating, door number, year of manufacture. The metal tag is to be riveted to bottom rail. On completion and testing of the fire resistant shutter, the manufacturer will supply a certificate of compliance, stating that inspection of the installation has been carried out and complies with the standards and/or specifications. This certificate will be passed on to the owner or builder to be forwarded to regulating authorities. Fire resistant roller Shutters may be wired in conjunction with smoke detectors and fitted with an Automatic Reverse Touch Sensor where required, or specified. The curtain and guide channels will be fabricated from galvanised material. All remaining components will be given a coat of zinc rich Grey primer.